The second link and third link document the worsening water shortages along the Rio Grande River basin. The second link has a good analysis of the problem (keep scrolling through the many ads to read it in its entirety). It states “the entire West is under siege,” and that the ongoing drought is now “a historic challenge.” It describes some of the thorny legal issues as states and cities fight over conflicting and confusing water rights. It notes that Colorado has reneged on one water agreement, and that Texas and New Mexico are opposing each other in a water rights battle that has gone to the US Supreme Court. The once-mighty Rio Grande River reportedly is down to barely a “trickle” by the time it reaches El Paso, Texas, and farmers are resorting to such desperate measures as using brackish well-water that will poison plants long-term even as it enables the ground to produce some produce in the short term. The third link reports that irrigation has dropped groundwater levels “as much as 200 feet in [just] the past ten years,” and that overpopulation is a major cause of the water woes as large southwestern cities grew tremendously during “an unusually wet period” that has now turned into very arid conditions. Water conservation measures will only go so far to alleviating this problem. The only long-term solution is to find more water or reduce the southwest’s population to sustainable levels. The latter is politically hard to do, but some imaginative minds are seeking new water for the thirsty southwest states in a very unlikely location. The fourth link describes a strange plan by the western states to essentially seize water from someone else in a distant location. The southwestern states intend to use their political clout to compel American Great Lakes states to start draining water from the Great Lakes region and sending it to the southwest states via massive pipes serviced by even more massive infrastructure additions. One cost estimate is that it will require the energy of “several hundred” power plants just to pump mega-billions of gallons up the Continental Divide and send it to the southwestern states. Does eco-friendly California really intend to try to force the nation into building hundreds of new nuclear and coal-fired power plants to divert water from Great Lakes states to California and other southwestern states? Don’t laugh–this is a serious proposal. So serious, in fact, that the writer of the article (from Minnesota) predicts it will eventually happen. Personally, I doubt it will ever occur. The Great Lakes states wield at least as much political power as the Southwest states and they do not intend to yield any water to California and the southwestern states. They have already taken action within Congress to prevent any Great Lakes water from being piped to California and the southwestern USA. In 2008, Congress adopted a measure that would require all eight Great Lakes states to consent to any shipment of their water to the southwestern states, and the article states that the federal governments of both the USA and Canada have a veto over any such plan. Another reason why I don’t think it will ever occur is that the cost is simply too “colossal,” as the article describes it. Paradoxically, California is already setting a precedent that will allow the Great Lakes states to disregard any federal action to compel water shipment from “their” great lakes to the water-profligate western states. California is leading the “sanctuary cities” movement that asserts state and local governments have the right to ignore federal laws they don’t like. The more they assert sanctuary cities rebellions vs. federal laws, the more the Left Coast states create precedents that the Great Lakes states will also have the right to tell the federal government to “go to hell” if it ever requires them to allow western states to seize “their” water. If such a madcap scheme were ever passed by Congress, I can see the governors of many large Great Lakes states calling out National Guard troops to stop any work on any such project. How bad is this problem? It’s very bad and it’s getting steadily worse. 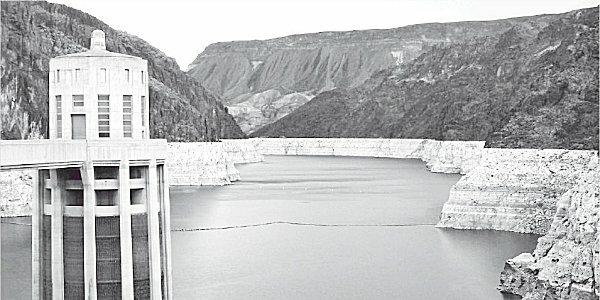 The southwestern states have encouraged “unsustainable growth” and have given water to city-dwellers and rural regions alike at “astonishingly low cost.” The article in the fourth link also asserts the southwestern states are in “collective denial” about the extent of the problem. That article also reports that NASA computer models warn that western states “could be facing a 50-year megadrought, the first…since Europeans even knew North America existed.” [As an aside, I can’t help but mention my books document voluminous secular evidence that many Old World civilizations not only knew about North America but exploited its resources for well over two millennia before Columbus arrived here.] The fourth link adds a warning from California’s own Jet Propulsion Laboratory that the drought crisis is “more serious than most realize,” and grimly warns that it may even be “unsolvable.” The fact that the American southwest can experience truly historic droughts many centuries apart may explain the abandonment of the ancient southwestern Anasazi civilization. Its inhabitants may have been forced to migrate elsewhere due to a previous prolonged drought in the American southwest. Allow me to point out a readily-available solution to the drought problem. California, Oregon and Washington are located on the Pacific Ocean and Texas is on the Gulf Coast. The Pacific Ocean and the Gulf of Mexico are literally, right “next door” to these states and the oceans have inexhaustible supplies of water. For a tiny fraction of the cost of some grandiose boondoggle to pipe Great Lakes water to the southwestern USA, these states can build a large chain of water desalination plants that will not only meet their needs for water but make these states water-exporters to other “dry” states. They simply lack the will and foresight to implement what is obviously a ready solution to their drought problem. If California gets its water from the Pacific Ocean, it will not need any Colorado River water so that river’s water can eventually be allocated entirely to the inland southwestern states. The fourth link dismisses de-salinization options because San Diego’s current desalination plant produces water too expensively. There are two glaring problems with that conclusion. One is what is considered “too expensive” when the alternative is no water at all? The second reason is mind-numbingly obvious. Israel, Saudi Arabia and other nations are producing fresh water from desalination plants at affordable prices. The obvious solution is to build a series of desalination plants along the Pacific Coast states using Israeli (and other nations’) desalination technologies which produce water at affordable prices. Rather than trying to steal water from Michigan, Illinois, Wisconsin, Ohio, Pennsylvania, Minnesota, Indiana, and New York, California should float a major bond issue to build a large number of desalination plants along the Pacific Ocean to supply their own citizens’ needs. The bonds should carry very high ratings as the financed product (fresh water) will have an un-ending demand in the arid American southwest. This is simple common sense. However, common sense is a commodity which, in the view of many of us who live in red-state America, died out in California’s governmental halls long ago. If I lived in California or in the American southwest, I’d strongly think of moving elsewhere before this crisis spawns civil unrest and perhaps even literal water-wars in the southwestern region. As several of my previous posts have mentioned, much of the USA’s vegetables, fruits and nuts are grown in California (and one of the links mentions the arid Yuma, Arizona area supplies much of the nation’s winter vegetable supplies). If the water runs out in the southwest, other parts of the USA will need to start growing table food instead of corn and soybeans. This will eventually affect all of us, if the climatologists’ predictions of a historic, long-lasting drought come true. Revelation 6:5-6 prophesies that food will be rationed by price in the latter days of our age. Matthew 24:7 warns that famines will characterize the latter days just before Jesus Christ’s return. II Timothy 3:1 warns that “perilous times” will come in the latter days. You can prove that we are living in those prophesied times by reading my article, Are We Living in the Biblical Latter Days? For a common-sense, biblically-based approach to preparing for such times, I recommend you read my article, Should Christians Prepare for Future Hard Times?